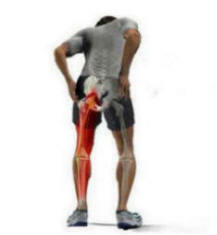 The most common levels for a sciatica are L4-5 and L5-S1. The onset of symptoms is characterized by a sharp, burning, stabbing pain radiating down the posterior or lateral aspect of the leg, to below the knee. Pain is generally superficial and localized, and is often associated with numbness or tingling. In more advanced cases, motor deficit, diminished reflexes or weakness may occur in siatica. If a sciatica is responsible for the back pain, the patient can usually recall the time of onset and contributing factors, whereas if the pain is of a gradual onset, other degenerative diseases are more probable than disc herniation. Rheumatoid arthritis often begins in the appendicular skeleton before progressing to the spine. Inflammatory arthritides, such as ankylosing spondylitis, cause generalized pain and stiffness that are worse in the morning and relieved somewhat throughout the day. Fosamax alert "causes heart disease"